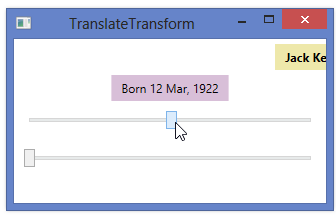 You can use a translation transform to translate, or move, a user interface element in the X or Y dimensions. You specify translation values separately in both X and Y dimensions, expressed in device independent units. You specify translation using a TranslateTransform element, setting values for the X and Y properties. Both properties default to a value of 0. A LayoutTransform will ignore translation transforms (since the element will be moved around during the layout process anyway). So you only use translation transforms with a RenderTransform. 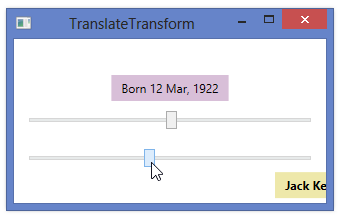 Here’s an example that uses a couple of Sliders to dynamically change the X and Y values of a TranslateTransform. 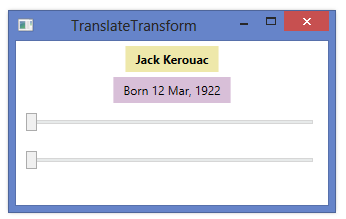 <TextBlock Text="Jack Kerouac" FontWeight="Bold" HorizontalAlignment="Center"
<TextBlock Text="Born 12 Mar, 1922" HorizontalAlignment="Center"